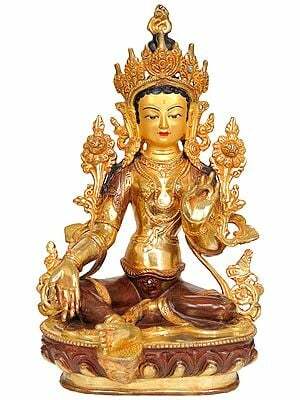 10.0" X 7.5" X 4.0"
6.5" X 5.0" X 4.0"
The female Buddhist deity is of great relevance to the minds of today. They are not restricted to the small mountainous pockets where the religion of the Buddha is practised, nor to the time of the sages in whose meditations these figures emerged. Remaining in touch with these deities, done through visualisation sadhana, has the power to transform one down to the soul. A lot of how this works could be explained by Jungian psychology, which has demonstrated that the conscious layers of the individual's mind is accompanied by unconscious depths populated by archetypal forces of great significance. Having been taken for granted by religions as ancient as Hinduism and Buddhism, it is in the meditative imaginations of great Buddhist rishis and munis that these powerful archetypes have gained form and colour. A range of bodhisattvas and Buddhist yoginis, the finest of Nepalese handiwork, are to be found in this exclusive female deities section. From the many calm and beauteous forms of Tara to the terrifying wrathful deities, these sculptures are so lifelike they would sweep the deeply meditating devotee off their asana at the peak of their trance. Sombre polished brass, signature gilded copper, and gorgeously pigmented finishes in rich pastels as well as monochrome metallics are some of the media of these works. 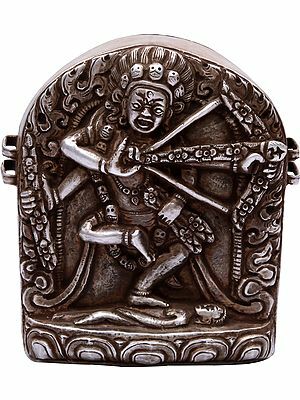 Some of these are actually ritual implements such as singing bowls, handheld bells, and lamps engraved with the forms of female deities as opposed to standalone figurines. Choose the devi that fascinates you most, sculpted in a way that best suits your space. "An enigmatic aspect of Buddhist iconography is the presence of wrathful, terrifying forms. Though these awesome, hair-raising images seem contradictory to Buddhist ideals, they are not personifications of evil or demonic forces. Rather they symbolize the violence that is a fundamental reality of the cosmos in general, and of the human mind in particular. In addition to destroying the passions of the mind, the purpose of gods is to protect the faithful. The wrathful deities, who symbolize the tremendous effort it takes to vanquish evil, especially perform this function."